Stunning pieces of glass art are designed to add character and class to your interior. Large decorative glass bowls can transform your home. There are many different types of decorative bowls that can be used for different types of homes. This guide will help you find the decorative glass bowls that you are looking for. What Are Decorative Glass Bowls? A decorative glass bowl is a form of glass art that’s used for interior décor and design. The bowls range from different size. Some are small while others tend to be huge. The bowls are largely used to accentuate the living room. For many interior décor experts, the bowls are complimentary accessories that bring the entire décor together. But it’s not just a case of going online and buying the very first decorative bowls that you come across. Choosing the perfect design that rhymes with your home’s interior is often recommended. If you are going to invest money on decorative glass art then it’s only fair to ensure you show it off in the best way possible. The key is to make the bowls the focal point in the living room. It needs to be the accessory that grabs the attention of people who step into the room. In addition to this, you may consider adding a decorative bowl to your entrance. If you want to add more magic to the splendor of this glass art, try to also incorporate accent tables with the design. Instead of having a giant glass bowl sitting on the dining table, consider adding one accent table in one corner of the room and setting the glass art there. Ensure the bowls are also placed at a good height. You want the beauty of the glass art to strike anyone as soon as they enter the room. Placing the bowls at the right height ensures this. What Type of Decorative Glass Bowls Should You Buy? It really depends on your taste. However, we would recommend handcrafted glass bowls. They are truly one of a kind. Their unique touch will be a huge plus for your home. Exhaust all your options too. There’s a lot of creativity these days in decorative glass bowls. Some designs may appear simple while others may have that outlandish appeal that you’ve been looking for. But if you don’t take your time looking at all the design options available, you may not find what you want. In case you don’t have the time to do research, we have prepared a list of 10 decorative glass bowls that you can choose from. The Cole Grey Decorative Glass Metal Bowl is a simple and creative glass art with a sweet touch of iron. The bowl is 70% glass and it sits on a majestic iron stand for support and functionality. The black iron does a great job to accentuate the transparent glass. It’s a simple design that really catches the eye. This bowl is the perfect gift idea. Its style and artistry is something to savor too. The art is perfect for homes with unique décor. Its contemporary charm is brought out by the vivid turquoise that can add a vibrant hue to any room. It’s the ultimate glass bowl for anyone with a taste for something special. The Urban Designs Rippled Decorative Glass Bowl features a creative ripple edge to it. The bowl will be the perfect dining table centerpiece. It can also be a good shelving accent for the kitchen or your home library. The aqua coloring finish is breathtaking too and it delivers just the right amount of charm for you. Just like the name suggests, this glass bowl is designed to replicate celestial bodies. Its impeccable colors and textures coupled with outstanding craftsmanship are absolutely amazing. You also get a modern and sleek stand too. 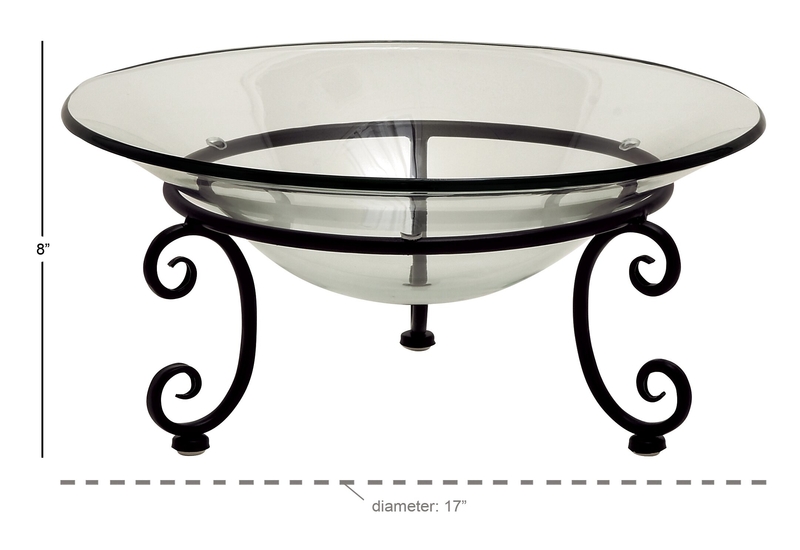 The Celestial Decorative Glass Bowl with Stand is perfect for contemporary décor designs. The Cole and Grey Metal Glass Decorative Bowl is simplicity with class, combined with the ultimate decorative bowl. It features a simple glass bowl with a creative metal stand. The unique lacy scrolls on the iron stand make the bowl stand out. The shiny finishing on the iron is also a great addition to note. If you are looking to create the best chic focal point, this is the bowl for you. It can be placed on the coffee table or the Foyer console. Either way, this cool-hued bowl presents an eye-catching display for anyone. Make sure you add decorative orbs for the best results. This will add a new level of appeal to your home. The Rose Cliff Heights Coastal Glass Decorative Bowl is an artful accent that will be perfect on your dining table. The contemporary artistry is designed to add a splash to your décor style. The bowl is handcrafted, and its distinct silhouette and the smooth rounded bottom complete the design perfectly with a glint of glamor and excellence. You can add a taste of global and exotic style to your interior with this simple bowl. This piece is handcrafted in Turkey using 100% glass. Its botanical motif is showcased with classic paisley accents crafted carefully around a geometrical border. The bowl is topped with a sophisticated splash of color to blow anyone away. If you ever wanted the ideal conversation starter, this Petersen Abstract Glass Decorative Bowl is your perfect choice. Its daring contemporary design makes it ideal for any room at home. The design is also quite unique and charming. The Bloomsbury Market Modern Glass Decorative Bowl is pure glass artistry with a distinctive wavy silhouette abstract pattern. Its bright hues of blue, red, and green make it the boldest dining centerpiece you have ever had. The bowl can also be placed in the entryway to charm your guest as they come in.